This is part 3 of a three-part series of mathematical speculations about bees. 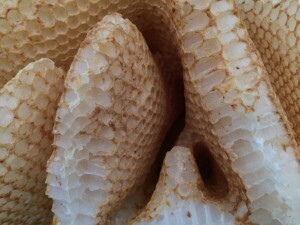 Part 1 looked at honeycomb geometry, and part 2 looked at how bees estimate nest volumes. The sight of bumblebees roaming around British gardens, foraging for nectar, is common and comforting. The movement of these fuzzy bees between flowers and plants can often seem deliberate yet erratic. Charles Darwin was intrigued by “humble-bee” routines1, and observed them with the assistance of his six children, but always regretted not attaching strands of cotton wool to the bees so he could follow them more easily2. Within the last decade there has been renewed interest from a number of collaborating researchers into studying bumblebees’ movement between flowers and their foraging techniques. The prevailing journalistic spin on this research seems to be ‘Bees solve the Travelling Salesman Problem – a problem that mathematicians and computers cannot solve’. This is unfortunate, not least because it is gleefully misleading, confusing various meanings of ‘solve’, but also it obscures a lot of the fascinating underlying scientific investigations. This is part 2 of a three-part series of mathematical speculations about bees. Part 1 looked at honeycomb geometry. Honeybees scout for nesting sites in tree cavities and other nooks and crannies, and need to know whether a chamber is large enough to contain all the honey necessary to feed their colony throughout the winter. A volume of less than 10 litres would mean starvation for the whole colony, whereas 45 litres gives a high chance of survival. How are tiny honeybees able to estimate the capacity of these large enclosed spaces, which can be very irregular and have multiple chambers? Bees have encouraged mathematical speculation for two millennia, since classical scholars tried to explain the geometrically appealing shape of honeycombs. How do bees tackle complex problems that humans would express mathematically? In this series we’ll explore three situations where understanding the maths could help explain the uncanny instincts of bees. Honeybees collect nectar from flowers and use it to produce honey, which they then store in honeycombs made of beeswax (in turn derived from honey). A question that has puzzled many inquiring minds across the ages is: why are honeycombs made of hexagonal cells? Deck the halls with τ of holly, formula-la-laaa! Christmas is a time for giving, celebrating, family and magic. But did you know it’s also a time for equations? Department store Debenhams has decided to honour this recent Christmas tradition by tasking at least two members of Sheffield University’s undergraduate maths society to come up with formulae for ‘a perfectly decorated Christmas tree‘, picked up by The Sun, The Metro and others. Photo by Aleksandar Cocek, used under a Creative Commons licence. 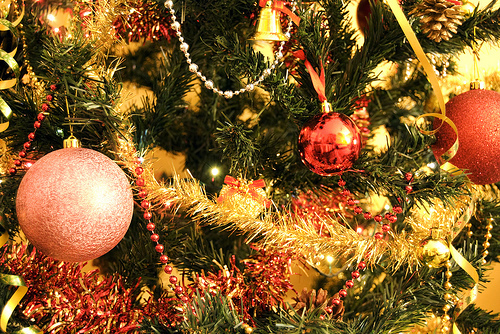 Previous festive howlers include ‘the formula for the perfect family Christmas‘ (sponsored by The Children’s Society to promote a book) and a prior stab at ‘the equation for the ideal Christmas tree‘ (sponsored by B&Q), which are just nonsensical strings of abbreviations. However, unlike those examples of naff-ematics, the Sheffield tree-decorating equations make enough sense for me to take a critical, overly-serious look at them on their own merits, and show how you might begin to come up with something more rational. But if you don’t take his word for it, look on over at his entry on the Mathematics Genealogy Project, and you’ll find his thesis is on “Additive and Non-Additive Set Functions”. The Nobel prize website has some details on the theory of stable allocations and market design, but an old AMS feature column gives a gentler mathematical introduction, via the elegant graph theory of Hall’s Marriage theorem. My partner and I are trying to buy a house. We both work in different places, and neither of us enjoys commuting. How could we decide where to live?